The small-town Jewish communities' population leaked away in two's and three's, and before anyone was aware 50 families had melted down to 10.. To the folks back home the departures seemed temporary--to the service, to college, to anywhere-- but those that left had bought one-way tickets. When new synagogue buildings were built, seats were not only reserved for them but also for their children and grandchildren-to-be. Postwar optimism, which seemed to touch all things, was misplaced. Those who were left behind tried hard, some heroically, to keep things going. The evidence of the energy expended first to build and then to hold things together is one of the most impressive legacies of small town Jewish life. Temple Beth El in Corsicana closed its doors in 1976. 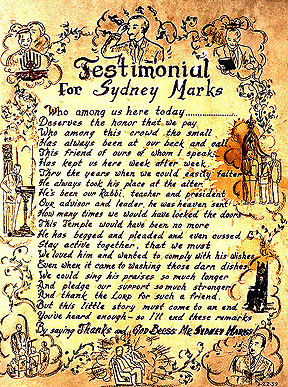 The building was sold to the city, faithfully restored for use as a conference center While rummaging amidst the junk left behind by the congregation in a forgotten corner, I found a hand-lettered and illustrated testimonial presented to Sydney Marks in1959. I understood their plight and was moved by the evident love and gratitude the congregation felt for this man. These people, only local heroes, are the real treasures produced by any community. Audrey (Daniels) Kariel grew up in Corsicana and remembers Sydney Marks well. She moved to Marshall when she married Louis and has lived there ever since. Louis Kariel's father, Morris, had been the "New Deal" mayor of Marshall in the '30's and now Audrey is serving her second term as Mayor as well. The Moses Montefiore Temple was built in Marshall in 1898. A social hall "Annex" was added in 1930, financed largely through the sale of hot tamales. It was arguably the handsomest synagogue building in the State. By the late '60's the dwindling congregation could no longer afford to maintain and repair the building, and in 1972 sold it to the city, who demolished it for a new fire and police headquarters. Had Corsicana closed in '72 it too might have been destroyed; had Marshall made it to 1976, it too might have been saved. In that time historic preservation had become a public cause, and monies and legislation were dedicated to it. In Marshall, Audrey Kariel would spearhead a community restoration effort to save the architectural legacy of the city. She has since overseen the construction of a new public library, the restoration of the Jewish cemetery among other civic projects. Maxine Simpson is the "Sydney Marks" of Wichita Falls. She moved with her husband to the adjacent military base in 1960, and has since become the sparkplug, booster, organizer, "balaat tefila", and lifeforce of Beth Jacob and the Jewish community. Once Orthodox under Rabbi Morris Goodman, the congregation now does what it must to keep its members and is the only visible Jewish institution left in the city. The Reform temple closed up in the '70's and has since been converted into a senior citizens center. Happily there are exceptions to the usual story of dwindling population. When other Jewish communities were drying up as their native sons and daughters left, Brownsville has enjoyed a succession of small immigration waves. After WWII European Jewish refugees, who had first settled in Mexico or South America because of restrictive US immigration quotas, finally managed to get into the country. Later Cuban and Argentinian Jews, fleeing troubles of another kind, found a sympathetic, Spanish-speaking community in Brownsville. Recently Israelis who have opened beach shops on Padre Island have joined the community. A few years ago they built a new synagogue and hired a young Reform Rabbi. By personal inclination and popular demand he has added an Orthodox minyan during the week, a conservative Saturday morning service, and is planning to make the kitchen kosher. When it comes right down to it, the decision to go to or from any place is an economic one. Non-Jews also left the small towns because they couldn't find jobs. But, that's not the end of the story. People who came of age after WWII will tell you they never intended to stay, even before it came time to think of finding a job. What were they seeking? A friend of mine living in Israel opened a bank account there which came with a Visa card. A few months later the Visa card was abruptly cancelled. When he inquired "why", the bank officer told him "No movement!" "What's "movement"?" my friend asked, and was answered (with "Jewish" inflexion), "Movement is movement!" Nothing much was moving in small-town Texas, and everything seemed to be in Houston, Dallas, New York, and Las Angeles. The fact is Jews have always been at the center of things, when and wherever that happened to be. The Israelis selling beach chazzerai on Padre Island would agree. One hundred years ago those same Jews would have been on the train to, and fifty years later from, Brenham. The infamous Breckenridge Buckeroos highschool football team used to have several minyan's worth of Jewish fans in the stands every Friday night. Now they have none, and Beth Israel is now known as the Abundant Life Church. Temple Mizpah (Watchtower), whose name comes from a popular WWII-era set of sweetheart tokens, was thrown up in Abilene in 1942 at the request of the Army to serve the Jewish contingent among 30,000 trainees. Now it imports a Rabbi from Ft. Worth for the High Holidays and the occasional simcha. 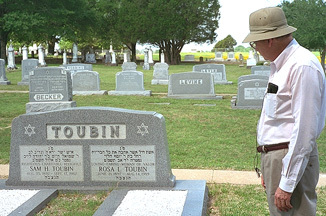 The little Shul in Brenham, Bnai Abraham, is kept ship-shape and ready for action by Leon Toubin. The ceiling fans have been supplemented by a new air conditioning system. The paint is fresh, the floors are clean, and the Parochet looks like new. Brand new Chumashim line the shelves. He tells a funny story about an attempt (never repeated) back in the '60's to stock the High Holiday Minyan with Jewish soldiers from surrounding bases who preferred the World Series to the Yom Kippur Mussaf service. School groups from Houston come out now and then, and Leon is always happy to tell them how it was. Everyone knows it will never be again.